It’s a Friday afternoon, and the last of those attending a worship service at the American Muslim Institute’s new mosque in suburban Omaha, Nebraska, have filed out. The talk and laughter shared after the service have given way to quiet. Imam Mohamad Jamal Daoudi stands at a large window inside the now-empty mosque, looking out at a picturesque scene -- rolling hills partially hiding the waters of a creek. The natural beauty of the land is just the beginning, though. There is something deeper, more profound, that has taken root on this former golf course and is now blossoming. Daoudi motions out the window. There, across the creek, is a Jewish synagogue. To the right, steel beams rising from the earth give shape to a new Christian church. In the midst of the three, the crest of a hill is the future site of the Tri-Faith Center. 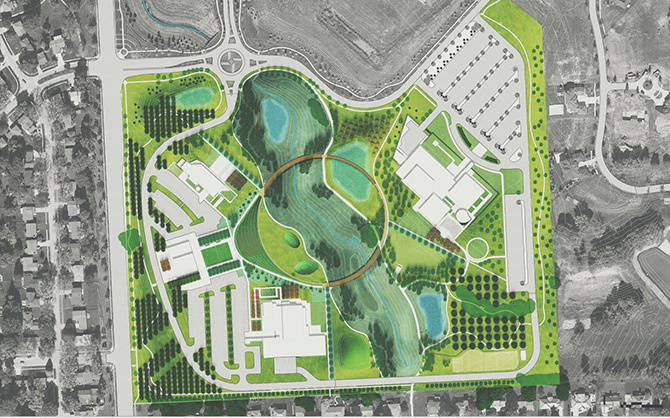 On this 35-acre parcel of land in Omaha, something historic is happening. Three Abrahamic faiths -- Islam, Christianity and Judaism -- are coming together, intentionally, to live as neighbors. 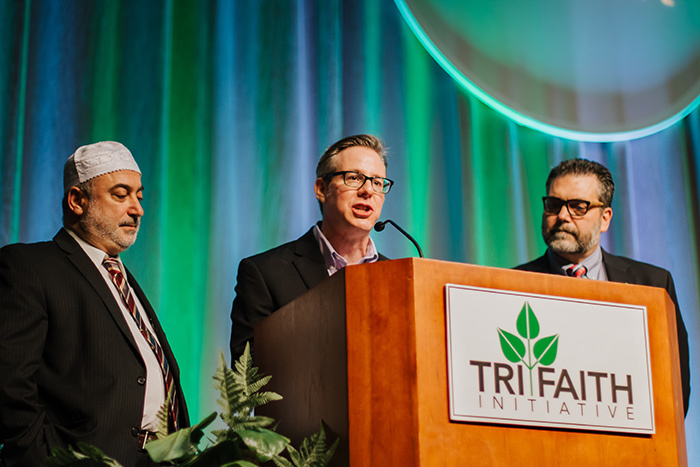 The Tri-Faith Initiative is an ambitious interfaith project on a scale unlike many others. What are the lessons from Tri-Faith that could be employed on a smaller scale? That uniqueness drew Heckman from his post in New York to Omaha to serve as the first executive director of the Tri-Faith Initiative. He began in March. Of course, the Tri-Faith campus is more than simply a collection of buildings. It is a guiding spirit, Heckman said, that focuses on building human empathy. With that belief as a guide, the campus has taken shape. Temple Israel’s synagogue was completed in 2013; the American Muslim Institute’s mosque and Islamic center opened in spring 2017; and Countryside Community Church United Church of Christ is expected to open in spring 2019 -- with the Tri-Faith Center to follow. A bridge is being designed to cross Hell Creek -- irony noted -- and connect the three worship spaces. “We believe that building bridges is more productive than building walls,” said Wendy Goldberg, a leader at Temple Israel, a founding member of Tri-Faith and a member of the board. 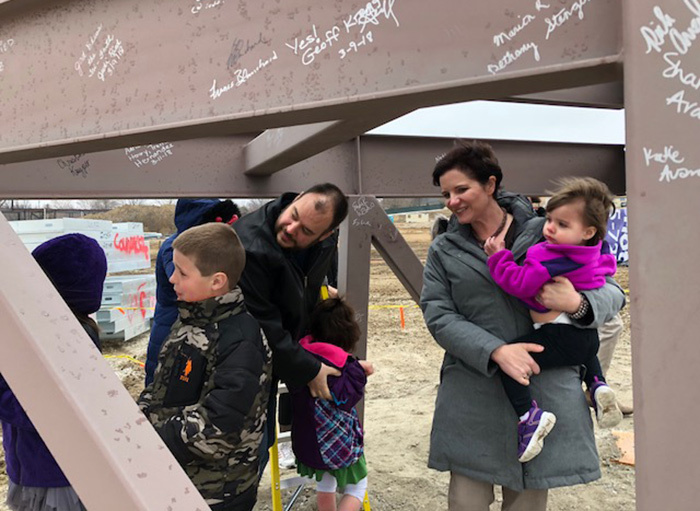 “We are building a beautiful bridge that will connect all of our buildings, and we hope that represents our intention,” she said. What does interreligious bridge building look like? The Rev. Dr. Eric Elnes, the senior minister at Countryside Church, said he experienced it when the former senior rabbi at Temple Israel spoke at Elnes’ church. The rabbi explained that one of the tenets of Judaism is that its adherents are still waiting for the messiah. While the Tri-Faith Initiative -- a nonprofit governed by a board with representatives from each faith partner -- is groundbreaking, its genesis was simple: Temple Israel wanted a new synagogue. In fall 2005, the congregation began considering moving from its location near midtown Omaha, where the synagogue had stood since the 1950s, to the more populous suburbs of west Omaha. Bob Freeman, a congregant and board member at Temple Israel, originally was against the move. Is your organization facing any practical dilemmas that offer an opportunity to address deeper theological issues? “My perspective was this: ‘Where we are is a great location. We have a great campus-like environment here,’” said Freeman, an Omaha lawyer. The temple’s neighbors were the Omaha Community Playhouse and First United Methodist Church. It was a community. The church and temple would provide each other overflow parking during holy days and major events. However, momentum for moving west continued to grow. And as they considered it more deeply, Freeman had an idea. “Why don’t we go out and recruit our own neighbors?” The congregation was intrigued. But, they asked, how do you do that? What would it mean to “recruit your own neighbors?” Could you do that, literally or metaphorically? Freeman and the congregation’s then rabbi, Aryeh Azriel, decided to find out. They thought that another religious community would be a good fit, and thanks to some common connections with Muslim leadership in Omaha, “we discovered that they, too, were thinking about building a new place of worship in west Omaha,” Freeman said. Leaders from Temple Israel and the American Muslim Institute met at a local library -- each bringing plates filled with baked goods to share -- to begin the small steps of building relationships and trust. “Once we furthered those conversations enough, … we said, ‘If the Jews and Muslims can be in conversations about this, surely there is a Christian church in Omaha that would want to be a part of this,’” said Freeman, who would become the chairman of the Tri-Faith board. The Episcopal Diocese of Nebraska joined the group as the initial Christian partner, and the Tri-Faith Initiative leaders signed a memorandum of understanding in 2006. In 2011, after a long search for the right location, land was purchased at 132nd and Pacific streets. It had been a golf course, established by the Jewish community in 1924, when other country clubs excluded Jews. Tri-Faith leaders first approached Elnes sometime during his first year as the new senior minister at Countryside Community Church in 2008. He had not yet heard of the initiative, but as he listened, he was inspired by the possibilities. “I was totally floored,” Elnes said. “I could not believe my good luck. It immediately struck me as one of the most important things I could imagine doing. It was beyond even a once-in-a-lifetime opportunity. 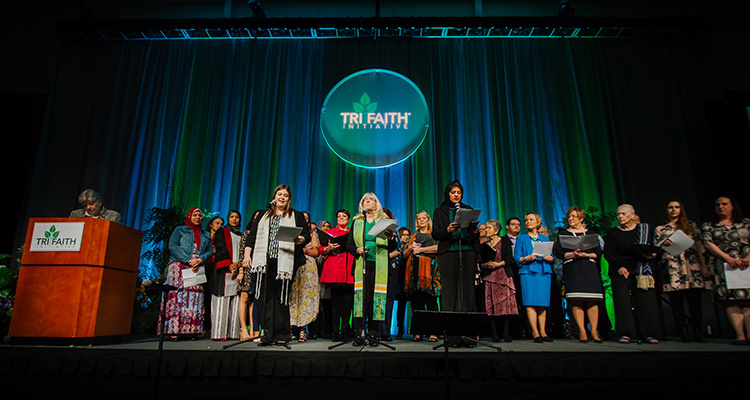 With Tri-Faith, Elnes saw an opportunity for individuals to claim their own religion as their ultimate spiritual guide while at the same time bearing witness that other faiths could worship the same God in a legitimate way. This would be a difficult decision for Countryside. Whereas Temple Israel and the American Muslim Institute had been looking for new worship spaces, Countryside, established in the Loveland area of Omaha in 1949, was comfortable with its location. When the diocese came forward with a proposal in 2014, Countryside called a congregational meeting. The decision to join Tri-Faith would require a vote of the members, and a majority had to approve. What do you think of this act of leadership? While Elnes was excited about the opportunity to join Tri-Faith, he didn’t want to influence the vote unduly. He wanted it to be the movement of the Holy Spirit. So he stepped aside from preaching during a 40-day discernment period. After much discussion, discernment and reflection, on April 12, 2015, 70 percent of Countryside’s congregants voted to join Tri-Faith. Not everyone in the congregation was for it. In fact, some 200 congregants would leave Countryside over the decision. The church currently has about 1,100 members. “I think the greatest misconception is that we’re all getting together to just sing ‘Kumbaya’ and emphasize the common ground, or that we’re trying to merge into one faith,” Elnes said. Written into the bylaws of the Tri-Faith Initiative is a ban on proselytizing on the campus grounds. The goal is for each religious community to fully live out its faith. “We are absolutely insistent and excited about a Muslim being a full-throttle Muslim, a Christian being a full-throttle Christian and a Jew being a full-throttle Jew. We want to relate to the other faiths as those faiths, not as watered-down versions,” Elnes said. A month after the church vote, the American Muslim Institute held a ceremonial groundbreaking. Construction of the temple was already complete. With the addition of Countryside Church, all the pieces were in place. “It actually appears to speak against this [initiative],” Elnes said. But he reads the passage differently from those who use it to assert that there are no other legitimate religions. “They assume that means that only Christians get in, and nobody else has any connection to God,” Elnes said. He counters that Jesus was speaking to his disciples, not to other religious groups, and that biblical names not only signify what a person is called but identify a way of life. Elnes calls these “great” loves the “3G network,” and adds a fourth promulgated by Jesus: grace. The other Tri-Faith religious leaders were also drawn to the project by their religious convictions. Imam Daoudi, who is originally from Damascus, Syria, is in his first year at the American Muslim Institute in Omaha, which was founded in 2006 as the American Institute of Islamic Studies and Culture and currently has 130 people attending its Friday prayer. He holds a D.Min. from the United Theological Seminary in Dayton, Ohio, and was the first imam to earn a degree from the seminary. He considers it part of his mission to serve as a bridge between Islam and Christianity, and he cites the Quran’s support for interfaith dialogue and collaboration. “In one of the verses, God mentions that it [would have been] so easy for him to create humans as one faith, one religion, one culture, one language,” Daoudi said. But instead, God gave humans the gift of diversity, so that we may better come to know and appreciate our differences. Syed Mohiuddin, a founding member of the American Muslim Institute and a member of the Tri-Faith board, added that this undertaking has strengthened his own faith, as well as that of others associated with the Tri-Faith Initiative. “When we talk to other people about our own religion, we have to learn about our own religion first,” Mohiuddin said. Rabbi Brian Stoller came to Temple Israel -- a Reform synagogue, the oldest in Nebraska, with currently 700 member families -- in July 2017, after plans were underway. He, too, found the Tri-Faith vision compelling. It is consonant with the Torah, he said, which teaches that you should love your neighbor as yourself, that all human beings are created in the image of God and that God has made a covenant with all of humanity. “We are seeking to live in intentional relationship with each other,” Stoller said. “To be in a relationship of that nature with another community means to affirm the fullness of the other. That means both aspects of our religious traditions that we have in common and those where we differ. With the planning and construction well underway, the communities are now building a life together. They’ve begun with shared events such as picnics, open houses and speakers. One of the major Tri-Faith events is Dinner in Abraham’s Tent, which brings together all three communities for fellowship and a meal. The gathering on April 22 drew more than 700 people and was livestreamed on Facebook. “Already in the life of the Tri-Faith Initiative there have been many ‘aha! moments’ for people who were leery about what it meant to be in relationship to the religious other,” Heckman said. What are the aha! moments in your congregation’s life together? How could you create more such opportunities for formation and engagement? 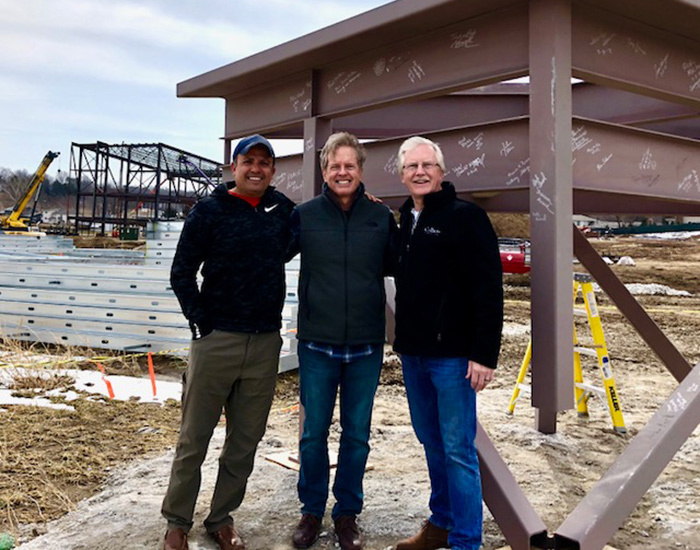 While the three faith communities are responsible for financing the construction and day-to-day operations of their own worship spaces, more than $62 million has been raised for the $65 million in shared campus costs, as well as initial operational and programming costs. About 99 percent has come from donors in Omaha. The faith leaders also meet regularly to discuss common issues, plan events and build relationship. The board votes on issues involving the campus as a whole. A proposal is tabled if one faith community unanimously votes against it, allowing time for discussion and alternative solutions. A final vote requires a majority consensus. Heckman will lead further fundraising efforts, and the Tri-Faith Center will serve a central role in developing additional initiatives to bring the communities together. Elnes also compared the Tri-Faith experience to that of three siblings, each unique and independent but all part of a family, becoming more fully aware of the depth of love their parents have for them. Elnes stepped aside from preaching to insure he didn’t influence the congregational vote unduly. What do you think of this act of leadership?